This entry focuses on the journey to our next destination. 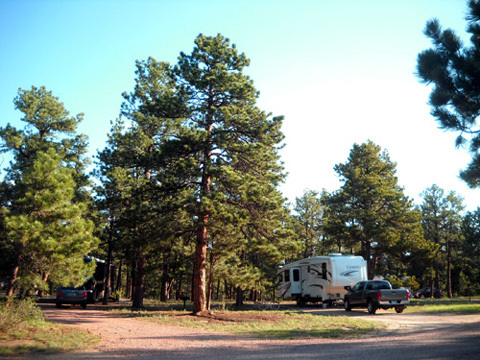 We made our reservations at the Air Force Academy's Peregrine Pines Campground several weeks ago and despite recent modifications to our summer travel plans, this is one destination we wanted to keep. Peregrine Pines is my favorite military campground of all the ones we've visited so far and the fourth time we've stayed here since discovering it last summer. 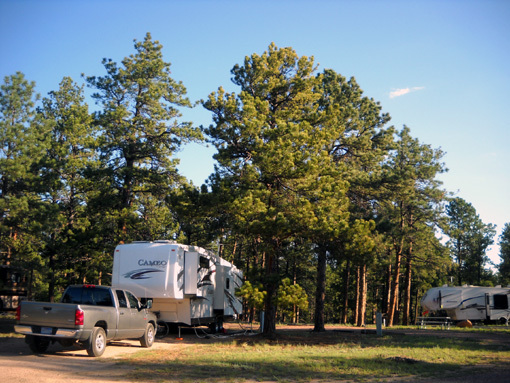 We've also discovered that this is a very popular campground when the weather is warm. It's difficult to just show up from May to September and expect to score a campsite unless you have a reservation. The occupancy rate is even higher this week than it was at the end of May when we were here for five days. Our current reservation is for two weeks. We can stay for a total of 30 days in the summer, so we can add on a few more days if space is available. We may also come back again in the fall for a few days. This entry describes our trip today from Silverton to Colorado Springs, a total of 309 miles with the camper in tow. There are other routes than the one I'll describe but I think this is the most scenic and about the most direct with an RV. "Direct" is relative in a mountainous state like Colorado. The distance is much shorter as the crow flies. We left Silverton at 7:50 AM. 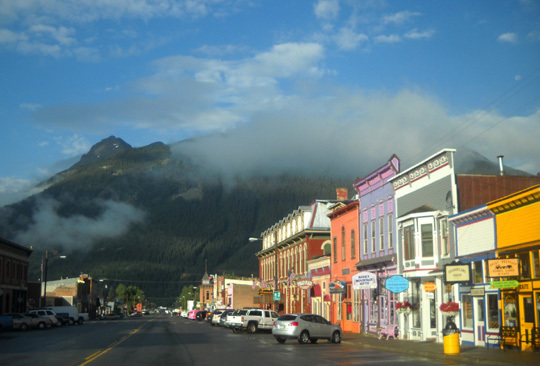 After the rain we had overnight the colors of the stores in town just seemed to pop . . .
Much of the route we took today is drop-dead gorgeous as it courses through various mountain ranges. 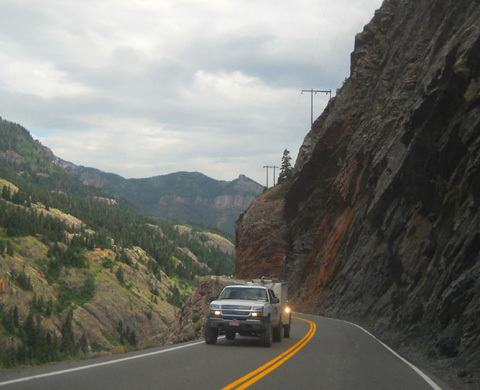 The 20+-mile section of US 550 through the San Juan Range between Silverton and Ouray, also known as the Million Dollar Highway, is the epitome of a scenic mountain road trip. The most dangerous miles, the ones I'm showing here, are closest to Ouray. 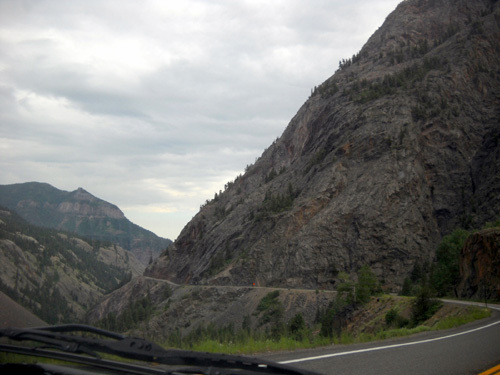 The more southerly section of highway between Silverton and Red Mountain Pass (elev. 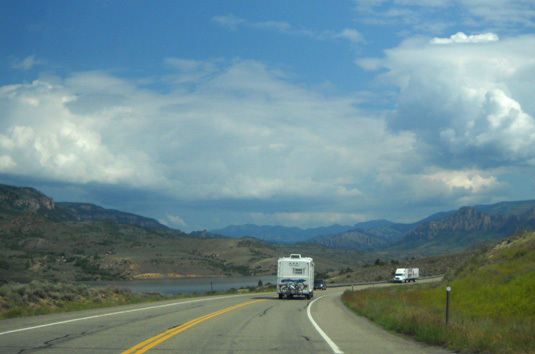 11,018 feet) is much easier for RVs -- and semis -- to negotiate. 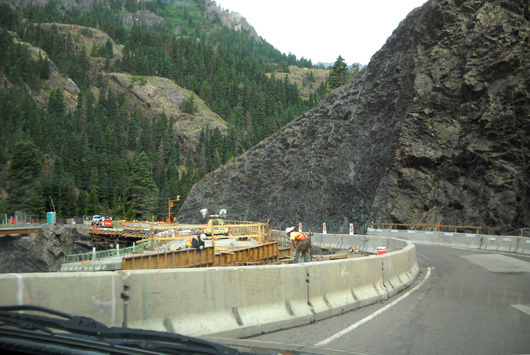 No guardrail, no shoulder = no room for error! Today we were going northbound from Silverton to Ouray, a much different story. Northbound traffic is infinitely safer. Now I was next to the sheer cliffs going up on the right, not vulnerable to the sheer cliffs going down on the left. I enjoyed this section a lot more today! 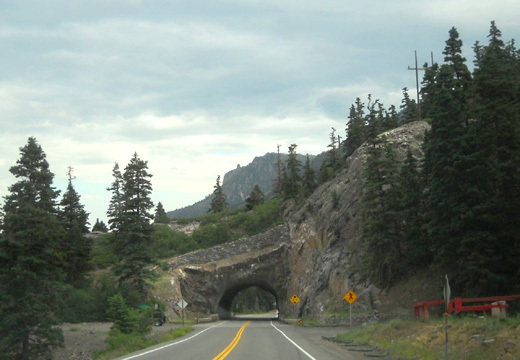 Bear Creek Tunnel near Ouray; the Hardrock course goes right over it. From Ouray north to Montrose the highway descends gradually through farm and range lands. We stopped for a few minutes at the Subway in Montrose for Jim to get breakfast, then turned east on US 50. 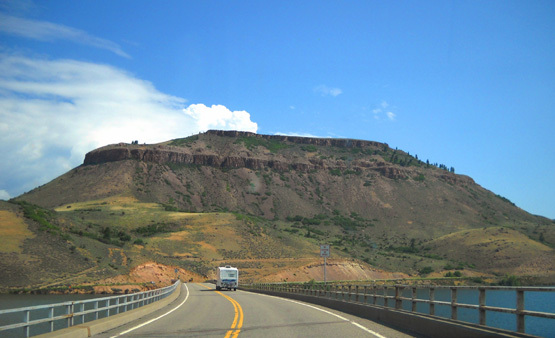 This is a great road through very scenic territory, including the Black Canyon of the Gunnison National Park, Blue Mesa Reservoir (below), and the mountains surrounding Monarch Pass. 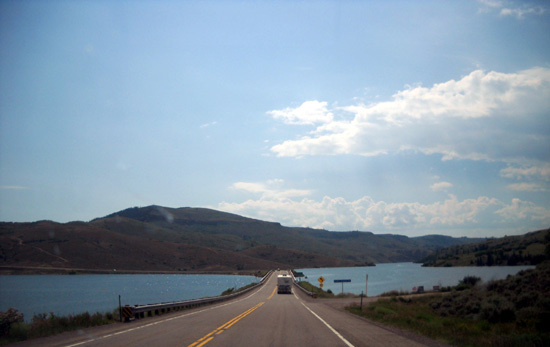 US 50 crosses the lake at least twice. We saw numerous RVs on this section of highway. There are several campgrounds along the way. 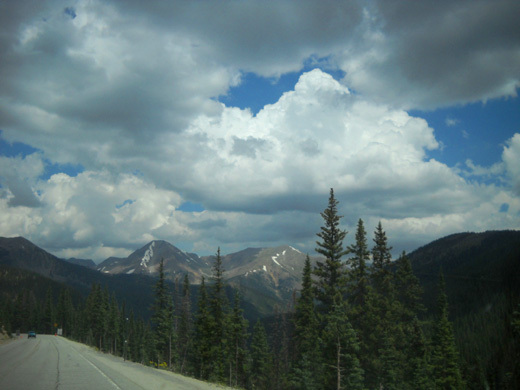 As long as your motorhome or tow vehicle has decent power and adequate brakes, you can handle Monarch Pass (elev. 11,340 feet) in either direction. Going eastbound from Gunnison the elevation gains about 3,637 feet. Our concern was going down the other side where there is a 3,875-foot descent to Poncha Springs. There is less snow on the Continental Divide in this area and the Collegiate Peaks north of Poncha Springs than there is in the San Juan Range near Silverton. The clouds were very interesting today. It was mostly sunny on our trip and plenty hot at the lower elevations (90s F.). Much of the eastern two-thirds of the nation is still in a heat wave and setting high-temperature records. We got 10 gallons of diesel fuel in Poncha Springs at Shell for $3.89, then saw it at $3.66-67 in Woodland Park. For comparison, diesel prices in Ouray = $4.19; Montrose = $3.82 to 3.99; Gunnison = $3.86 to $3.99. I didn't notice the prices in Colorado Springs but in May they were about the same or a little higher than Woodland Park. We can't get diesel on base at the Academy. 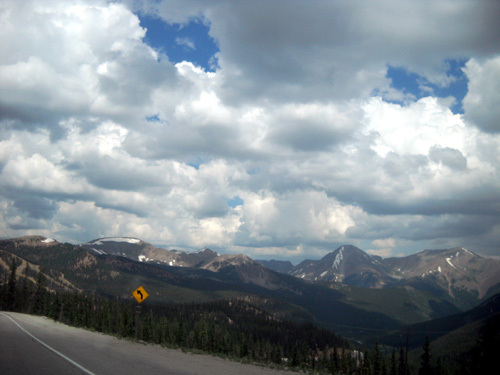 This scenic highway runs through the valley east of the Continental Divide, affording great views of several 14ers. Mounts Shavana, Antero, Princeton, and Yale are the closest to the road. Princeton and Yale are the two southernmost mountains in the Collegiate Peaks group. 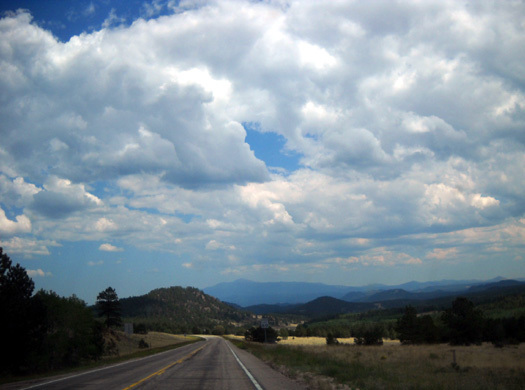 US 285 is a good, fast road in this 21-mile segment. Just south of Buena Vista we turned east on US 24/285, another smooth, fast highway that is fine for RV travel. At Antero Junction the two roads split. 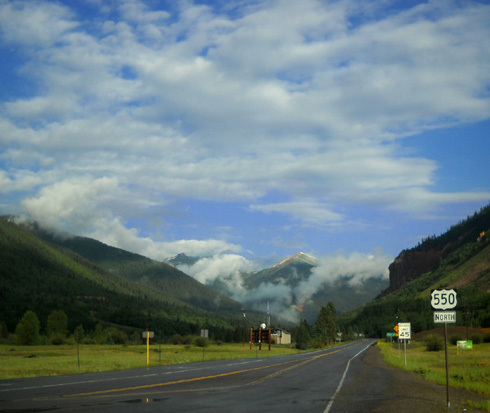 US 285 continues north and east past Kenosha Pass to Denver. 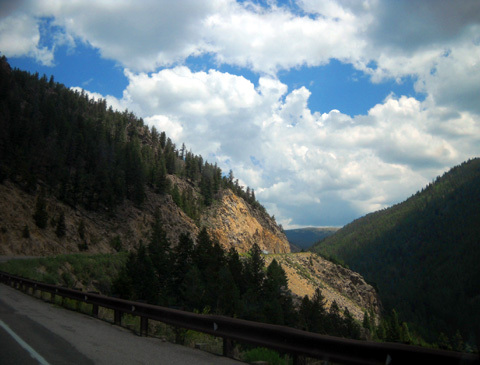 We followed less-busy-but-equally-scenic US 24 to Colorado Springs. 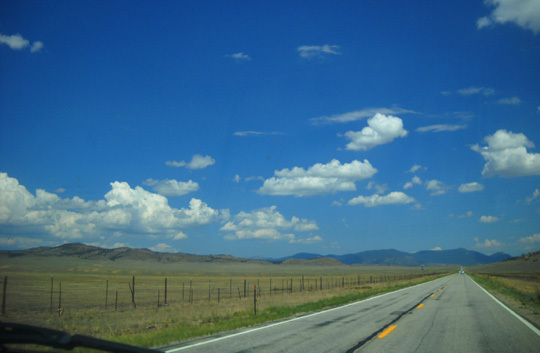 For several miles east of Antero Junction US 24 passes through flatter terrain in a large agricultural area known as South Park (above), then becomes more hilly again as it approaches Wilkerson Pass (elev. 9,502 feet). 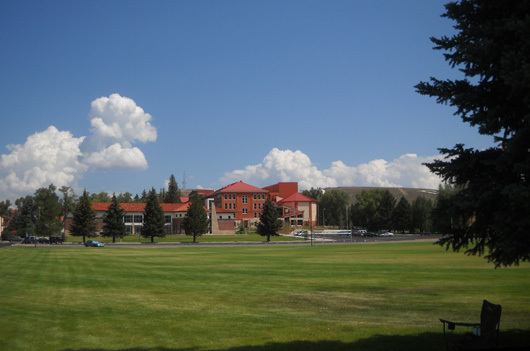 Travelers pass Lake George, Florissant Fossil Beds National Monument, Mueller State Park, the attractive town of Woodland Park, the road up Pike's Peak, touristy Manitou Springs, and the beautiful red rock parks on the western side of Colorado Springs. 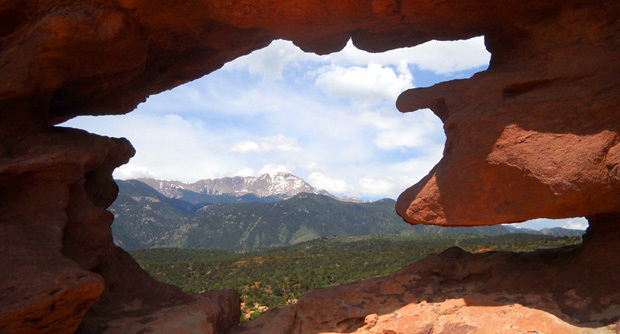 Very little snow is visible on Pike�s Peak from the west, north, and east. It�s more visually prominent and interesting when it�s got some snow on top but it looks like I'll be able to hike up the Barr Trail as far as I can manage this time. In May there was too much snow to reach the summit. 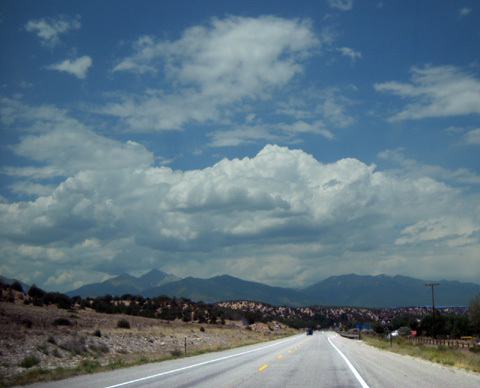 There was very little traffic on US 24 between Antero Junction and the town of Divide, then heavier from there to Colorado Springs. US 24 intersects with the freeway at exit 141. From there we had a nine-mile drive to exit 150, where we turned west on Academy Blvd. and drove into the Academy's south gate. Due to the placement of barriers large RVs can enter this gate more easily than the northern one at exit 156. It's OK to exit via either gate with a camper. The campground is about three miles north of the gate on Stadium Blvd. When we checked in we were assigned to site #61 in the 50-amp loop. 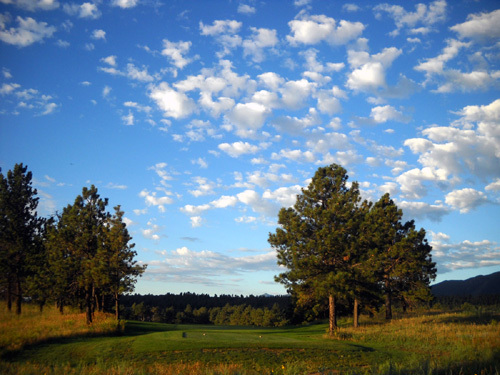 It's a spacious pull-through site with nearby pine trees that will offer shade on the doorside most of the day. We have lots of room between our camper and the motorhome on that side (to the left in the photo below). Site #62 on our back side is pretty close but no one is in that site; it's pretty small and one of the last ones filled in this loop. Temps were in the mid-90s F. this afternoon so we got the two AC units revved up pretty quickly. It's definitely warmer here at 6,670 feet elevation than it was in Silverton, elev. 9,300+ feet. Most of the country is in a searing heat wave this week, including Colorado. When it was slightly cooler after supper I walked around the campground with Cody and rode my bike for a while to check things out. The campground is about 90% full. There are three other Cameos and one Carri-Lite in our loop. There have always been other Carriage, Inc. coaches at Peregrine Pines when we've stayed here. I talked with one of the owners this evening. He and his wife are teachers from Florida, almost our age but not retiring for another two years. They have a 2008 Cameo 35SB3 and have had similar problems with it as we have (ours is a 2010 35SB3). I said hi to another couple from Oklahoma in a 2010 Cameo 37-something. There�s also a 2011 coach like it with South Dakota tags but we haven�t talked with them or the Carri-Lite owners yet. This trip was enjoyable because we didn't have to rush, the scenery was gorgeous -- and we had our rolling residence with us. Yea!!! I'll gladly compromise fuel mileage and speed to have the convenience of my own kitchen, bathroom, bed, and "stuff" when we're traveling from Point A to Point B. Now we're looking forward to at least a couple weeks with full hookups, more shopping opportunities than anyone needs, and a plethora of hiking and cycling trails nearby. We really like to visit this area.